Most children get sick every now and then, so day nurseries need to have rules in place regarding ill children and specifying how caregivers and parents are to handle children's illness. Since some conditions can prohibit kids from attending the nursery with other children, parents need to be provided with a clear and definite sick child policy as part of their initial registration paperwork. Working parents are often juggling a number of responsibilities and it can be quite disruptive when their children fall ill during the workday, but most child care centres do not have the ability to care for sick children and require that parents make other arrangements while their children are recovering, especially if the condition is contagious. While parents may offer some resistance to keeping their children away when they are suffering from mild illnesses, day nursery owners need to stress that fact that sick child rules are in place for the protection of all the children and therefore must be strictly enforced. Sick child policies should be clear about the length of time that children need to be kept home after exhibiting symptoms, and should also specify which conditions require clearance from a doctor before the child will be readmitted. Having clear and reasonable rules in place can help to avoid misunderstandings between parents and nursery staff. There are times when children may need medication during the workday, when they are in the care of nursery personnel, so sick child policies should cover the rules regarding the dispensing of both prescription and over-the-counter (OTC) drugs. It is not unreasonable to expect that parents provide written instructions regarding times and dosages when their children require medication. 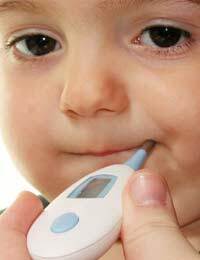 Pain relieving medicine for teething or other discomfort, antibiotics, or ongoing medications for conditions such as diabetes and asthma may be needed, but all medications should be administered only when expressly requested by parents and provided to caregivers in their original containers. Of course, prescription medications can only be given to the person for whom they have been prescribed, so if parents request that siblings be medicated, each child must have their own medication, labeled for their use. Good record-keeping is vital for day nurseries and pre-schools, so potential owners need to get in the habit of maintaining complete and accurate medical files for each child in their care. The children's health histories, as well as inoculation records should be included. Allergies or health conditions that may pose risks for children should be noted and prominently highlighted in their files, and all staff members should be made aware of such conditions so that they can be watchful for symptoms that may require emergency treatment. Finally, a copy of the centre's sick child policy, signed by a parent or guardian, should be kept with each child's records to show that they have been made aware of the rules and can be held accountable if they should choose to disregard them.